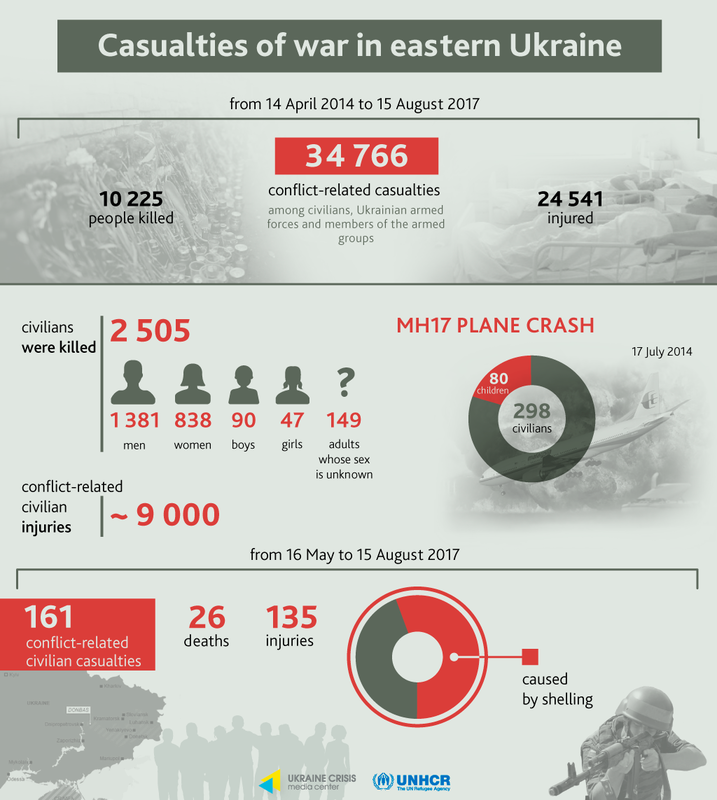 From May 16 to August 15, 2017, 26 civilians died in the frontline zone in eastern Ukraine, and 135 were wounded. “This is a 17 per cent decrease compared with the previous three months. In August, OHCHR recorded 41 conflict-related civilian casualties. By comparison, this is less than a half of a number recorded in August 2016,” said Fiona Frazer, Head of the UN Human Rights Monitoring Mission in Ukraine, at a briefing at Ukraine Crisis Media Center. The “bread truce” somewhat helped to reduce the number of casualties, despite the fact that there was no complete cease-fire. The report notes that the OHCHR is concerned about the lack of proper compensation mechanisms for the wounded, people who lost relatives as a result of hostilities, whose housing and property have been destroyed or damaged as a result of hostilities. The report emphasizes that agreements on a “security zone” around key water supply facilities near the contact line in Donetsk region have not been implemented yet, and that unresolved water supply problems may have irreversible consequences for local infrastructure in winter. Particular emphasis is placed on the difficulties of crossing the contact line, in particular through the exit-entry checkpoint in Stanytsia Luhanska. During the reporting period, 3.3 million people crossed the contact line. “In addition, all civilians queuing at the contact line, are at risk from shelling and the presence of mines and unexploded ordnance. During the reporting period, at least eight incidents of shelling near exit-entry checkpoints during operational hours were reported. In addition, at least two people were killed and another one injured by explosive devices located near the exit-entry checkpoints,” said Fiona Frazer. The Monitoring Mission expresses concern about the facts of illegal detention of people, holding them incommunicado, murders and enforced disappearances, tortures, and ill-treatment on both sides of the contact line. For example, Donetsk blogger Stanislav Vasin was detained on June 3, and his family knew nothing about him till mid-July. The Monitoring Mission has not received access to persons detained by militants of so-called “republics” to conduct confidential interviews with them in accordance with international standards. “This denial of access coupled with some first-hand information we have received raises serious concerns regarding the conditions of detention and the treatment of persons held by armed groups,” emphasized Fiona Frazer. There were cases when Ukrainian military also held detainees incommunicado during the day before transferring them to official detention places. The Monitoring Mission also express concern about the detention of entrepreneurs on charges of financing terrorism because they have paid taxes on the territory controlled by the so-called “DPR” and “LPR”. Fiona Frazer noted that since April 2017 none of the persons who at the beginning of the conflict have been serving their sentences in the detention facilities in the uncontrolled territories has been transferred to the government-controlled territory despite their requests. She urged for the restoration of this process. The report includes concerns about the lack of progress in the investigation of murders on the Maidan and in Odesa during the events of May 2, 2014, as well as progress in the investigation of the assassination of Pavel Sheremet. Fiona Frazer has noted as positive the changes that proceedings against militants of so-called “republics” are initiated according to the specific facts of human rights violations (illegal detention, tortures, etc.) rather than on general charges of terrorism. Despite the denial of access to Crimea, the Monitoring Mission recorded and included in the report the facts of violation of the right to a fair trial and substantial restrictions on the fundamental freedoms imposed by the Russian occupation authorities. A separate report on the human rights situation in Crimea will be made public in late September.